In the meantime though we hope you find our blog interesting… Happy reading! The Great Migration is the joint longest mammal migration on Earth. 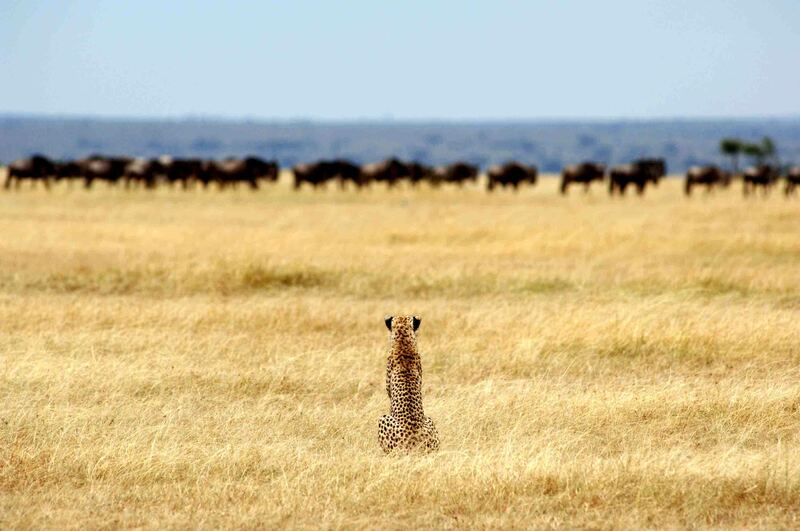 Contrary to popular belief, the wildebeest migration has a competitor for duration. 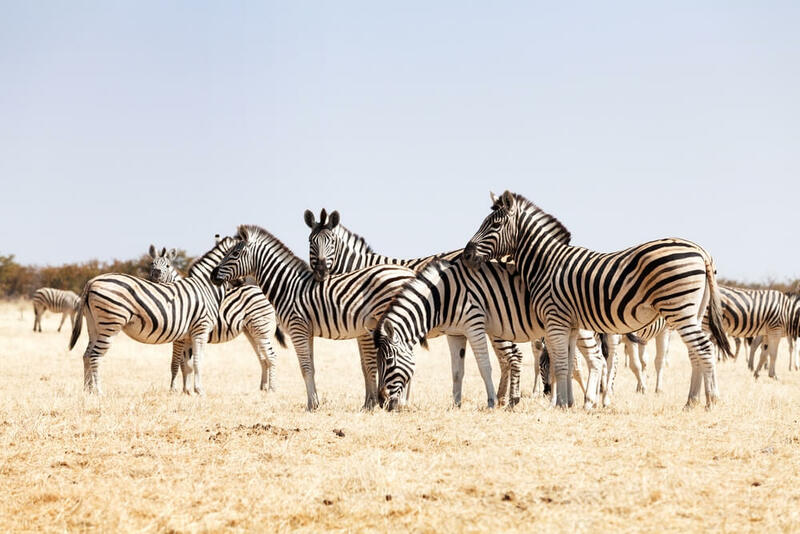 The length of the migration is also mirrored by the lesser known zebra migration in Botswana which sees the striped horses of Africa migrate from the floodplains of Chobe to Nxai Pan. And back again. Both migrations have a journey length of roughly 500km which is no short distance. It is not just wildebeest that migrate in the Serengeti. The Great Migration contains over 2 million animals, including 300,000 zebras and a whole assortment of antelope such as impala, eland and Thompson’s gazelles. The migration sees the animals move in a general clockwise direction through the Serengeti National Park, following the rains. The migration is ALWAYS in Tanzania. No matter what time of year it is, the migration remains in Tanzania all year long. 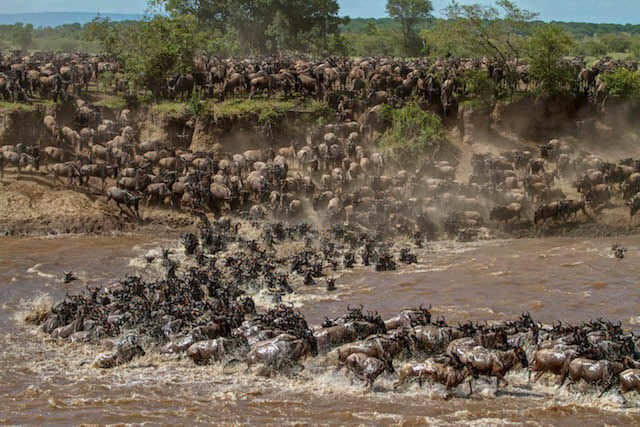 Parts of the migratory herds do move into the Masai Mara in Kenya from July until October; however the large majority of the herds at this time are still in the Northern part of the Serengeti. 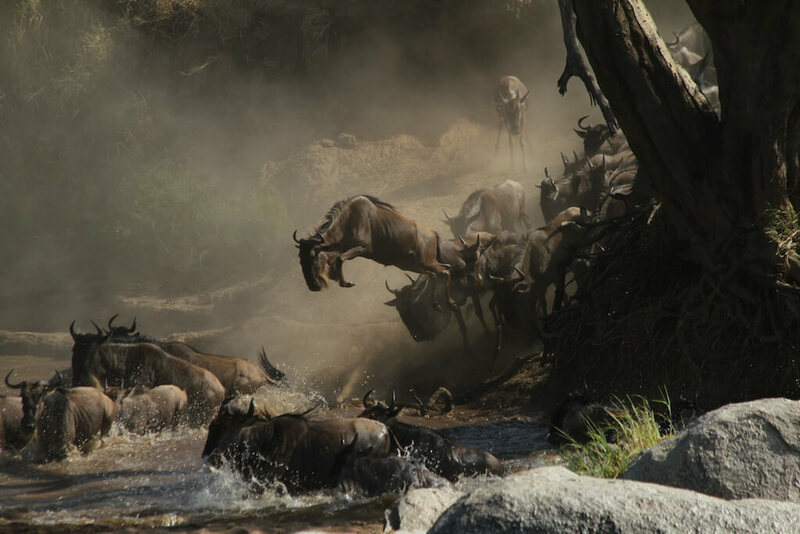 The famous river crossing that provides ‘documentary worthy’ footage is across the Mara River. The misconception is that this river crossing is from Tanzania into Kenya or vice versa. In fact the crossings that take place are in both the Serengeti and The Masai Mara, however if the wildebeests are crossing, they will finish in the same country they started. There is also a smaller river crossing across the Grumeti River in the Western corridor of the Serengeti. This is nowhere near as spectacular in terms of size and scale; yet drama including huge crocodiles is still very apparent. A symbiotic relationship exists between the zebras and wildebeest of the Serengeti. Put simply, without the zebras, the wildebeest wouldn’t be able to survive. Wildebeest are fussy eaters, they are selective grazers and only feed upon the shorter parts of the grass, but luckily for them, zebras are bulk grazers meaning they aren’t nearly as picky over their grass choice. As the zebras graze they essentially act as a lawnmower, cropping the grass and making it palatable for the wildebeest to consume. Crocodiles can wait a year for their meal. 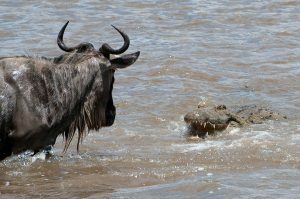 The crocodiles of the Mara River are known to be some of the biggest Nile Crocodiles in Africa and you would expect them to eat regularly. Without going into too much scientific detail, crocodiles can control their metabolism and their heart rate to essentially “shut down” whilst the migratory herds are not in the area meaning they don’t have to feed too often. They go into a state of near-hibernation and their biological system is so sophisticated that it means that the biggest of the bunch may only need to feed once or twice a year. There is only one type of wildebeest in the Serengeti. The wildebeest in Tanzania are the blue wildebeest. They are referred to as blue because in the sunshine, their glossy coats glisten a shade of blue. The wildebeest may also be named “gnu” by people. This is an interchangeable name and is an onomatopoeic derision of the sound they make. The Serengeti is only home to Blue wildebeest (the brindled gnu) but South Africa is home to another type, the black wildebeest, also known as the white tailed gnu. This type of wildebeest has heavier set horns and is slightly smaller. If you were to visit a breeding farm in South Africa you may even be lucky enough to see a golden wildebeest. A very rare specimen. The only time that you will see almost every wildebeest of the migration together is in the months of January and February. This time of year is the calving season and where half a million wildebeest are born in the South Eastern corner of the Serengeti and North Western area of the Ngorongoro Conservation Area. Over a few weeks thousands of new bleating calves enter the world, but this is also a prime opportunity for predators who also thrive at this time of year. The calves that are born are precocial meaning they can stand and are not entirely reliant on their parents within minutes, a vital survival technique that helps them keep up with the herd. The herds are always monitored and you can check online where the migration is. Guides and pilots send in their information as they see it, about the herd’s locations and movement directions which are then transferred to a website So, if you’re raring to go on a trip or you’re longing to be back after your holiday with us, you can find out what is happening wherever you are in the world! When you are looking at booking a honeymoon, no stone must go unturned to ensure you get the absolute best and most special trip possible, and for the best price possible… Especially when paying for weddings are also involved! At Tanzania Odyssey we really do know our stuff and can guide you to the most romantic lodges, experiences and special offers the country has to offer both on safari and on the beach. 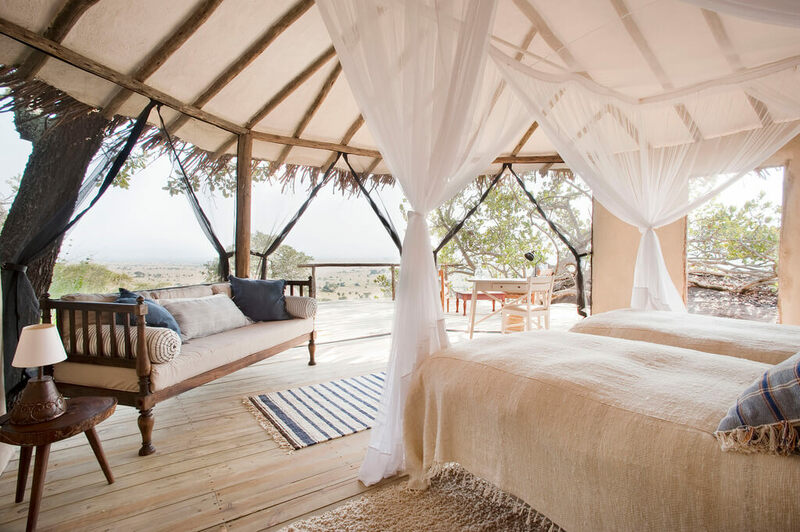 Let’s kick things off with the most romantic honeymoon experiences Tanzania has to offer. 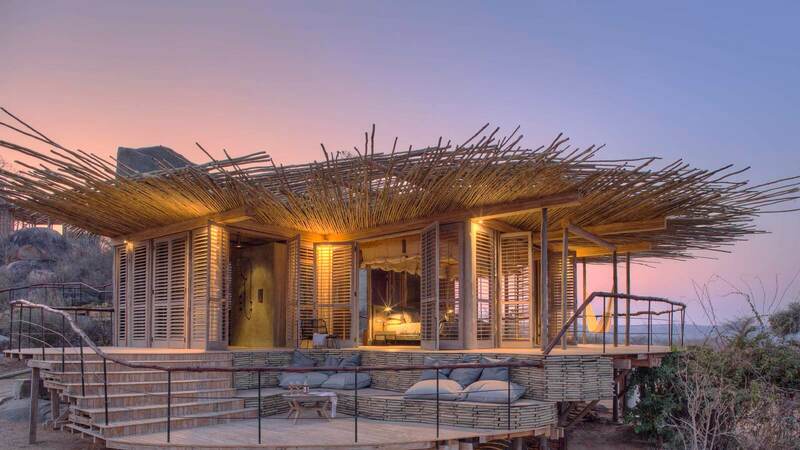 In Ruaha, you can’t get much more luxurious or much more wow factor than Jabali Ridge… We absolutely love this lodge. There is nothing quite like looking up and seeing the milky way in all it’s glory. What set’s this experience apart from any other is that in The Selous you are surrounded by pure African wilderness and all the stirring of the night which goes with it. Just you, your partner and a guide – it is an extraordinary experience and will probably be the most memorable evening you share with your new spouse. A little hidden gem in Zanzibar’s Stone Town can transform a nice evening wondering around it’s cobbled streets into a really special one. Book in advance for the Emersons rooftop dinner experience as it tends to get booked up pretty far in advance. You can either sit at a table or on the floor on the Zanzibari cushions… Wherever you sit though, the unmistakably atmosphere of Stone Town is all around. Choosing a Tanzania holiday as an elderly person is no different to deciding on a where to go for any other age; it is all about your unique preferences, priorities and selecting experiences which are close to your heart. Of course though, what is important to our more senior clients can be slightly different to our young honeymoon couples, for instance. The most important thing in our view is focusing slightly more on the relaxation and luxury side of things, rather than an especially hectic, action packed and busy holiday. 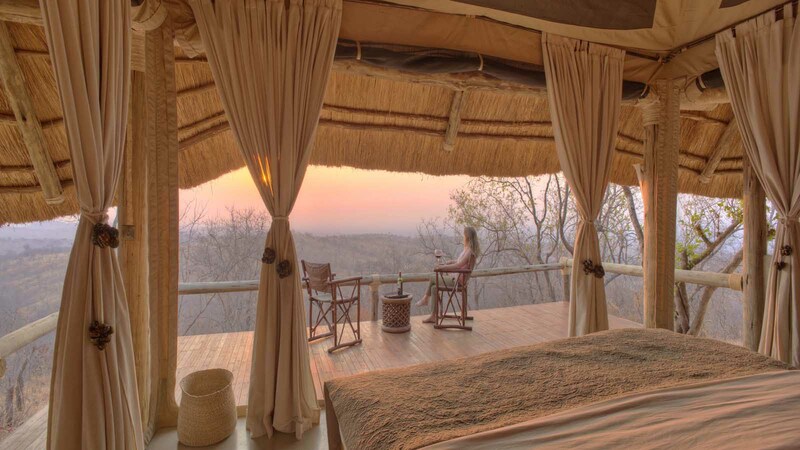 We know that older safari goers love to focus on getting off the beaten track to the privacy of their own little slices of wilderness, and that relaxation and the little things are what transforms their memorable holiday into an adventure of a lifetime. We would recommend looking at the southern parks of Selous and Ruaha for a seriously relaxing yet wild and authentic Tanzania safari experience. … And where better to relax into your adventure than in the total seclusion of the African wilderness? Many think of Africa and in particular African safaris as the height of holiday adventure, but we can let you in on a little secret…. Safaris are a fantastic option for those who love adventurous experiences, whilst avoiding all or any physically strenuous adventure in the process – in fact, we would say that 95% of the trips we love to organise are suitable for all ages; whether you are 6, 60 or 100 years old, an African, and specifically, Tanzania safari is an experience which should be ticked off everyone’s bucket list. Your average day on safari in both northern and southern Tanzania consists of an early morning game drive, brunch/lunch, and (usually) a little siesta before an afternoon game drive, before dinner and falling asleep again to the sounds of the bush… Although early starts can be tiring for any aged traveller, if you can sit in a vehicle for a few hours, you can certainly go on safari. 1. A safari is a once in a lifetime experience, and is often on people’s bucket list… With a little inspiration and guidance from the experts it is probably the easiest holiday you will ever organise both in the planning stages, and on the ground. 2. As soon as you land from your international flight, you basically get chauffeured from A-B and all the way back again. No stressful airport waits for hire cars, last-minute panics or looking through tour guides for the best experiences… Ensuring you have world class experiences is covered by us here at Tanzania Odyssey, and on the ground your activities and amazing wildlife opportunities are all waiting. 3. We tailor make all your trips to suit you entirely. Our experts have travelled and/or lived extensively throughout Africa and to all the places which we recommend. Let us know of any physical limitations and we will be sure to find something for every kind of traveller. We have an excellent relationship with all the lodges and camps we work with and as such, we can request little things to make your stay more comfortable and enjoyable. As an example, we know the rooms which are close to the main areas for easy access to the dining areas. 4. A safari game drive is suitable for absolutely anyone… It is one of the most adventurous, exciting yet relaxed holidays you can have. On the edge of being in the harsh and unruly African wilderness but in the comfort of your vehicle or room, there is no one who can’t enjoy the unrivalled wildlife opportunities a Tanzania safari has to offer. 5. 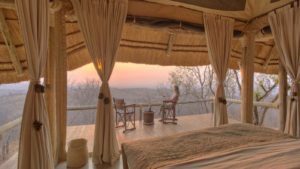 On safari, you will be extremely well taken care of by the intimate and personalised lodges you stay at – and honestly, on safari, nothing is to big of an ask for the staff there. The levels of hospitality exceed anywhere else in the world. We can’t stress enough that pretty much every itinerary we love to recommend is suitable for any aged traveller. However, there are only a handful of experiences which you should probably avoid if you are physically fit, but not as physically fit as a physically fit 25-year-old! Hiking Kilimanjaro, although some senior citizens may thrive on this kind of adventure, wouldn’t be advisable unless you are extremely fit and well trained. 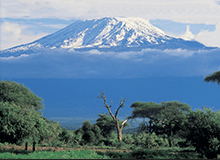 Of course though, you know yourself better than we do– some 25 year olds as much as some 85 year olds won’t be fully equipped to climb Kilimanjaro, so it is entirely dependent on you. All in all, we can’t stress enough that elderly or not, age really doesn’t matter when deciding where to go for your Tanzania adventure. 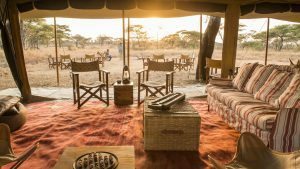 Safaris are extremely personalised and intimate holidays and as such are probably some of the most flexible; the managers at each lodge and camp will adapt to suit the unique and individual needs of every single guest. Due to our 20 years experience in creating inspiring Tanzania safari and beach itineraries, we really do know all our old favourites, and newly discovered spots around the continent like the back of our hands. Working with the team on the ground in each of our specialist countries for so long means we have excellent relationships with the camps and lodges, so as well as getting the best deals, we often go out to visit to see what’s changed and what’s new. From the best lit to the most private rooms, to the best guides, to the most comfortable vehicles, beds, and even to the most atmospheric camps; we really do know our stuff! 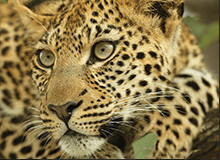 Booking a tailor-made safari with Tanzania Odyssey means you get the details right as well as the overall experience, making the whole holiday, and not just that unbelievable cheetah sighting, a truly unforgettable experience. For a chilled out and off the beaten track safari, you cannot go wrong with a combination of the Selous and Ruaha. With walking safaris, night drives, boating and some seriously intimate and charming camps, we absolutely love this combination. Many think you will compromise on wildlife viewing by missing out the northern parks, but we can say from visiting recently, that this simply isn’t true! They compliment each other beautifully, as the Selous is full of giraffe, elephant and beautiful watery scenery, whilst Ruaha has huge herds of buffalo and is big cat galore, as it is home to 10% of the world’s lion population (as well as all the rest!). Southern Tanzania is also one of the last strong holds of wild dogs; the safari enthusiast’s prize sighting. For an extension of relaxing, we can think of no spot better than Ras Kutani on the mainland coast, which is in our opinion the best beach ldoge in East Africa. Ran by a safari company, they really know how to look after their guests. Day 8: Flown to Dar, connect for 15 minute flight to Ras Kutani. And chill. Now for the stars of the north, these are two of our absolute favourite accommodation options. Plantation Lodge is a beautiful and very well priced option in the Ngorongoro Highlands and offers a bit of permanent structure before your mobile safari in the Serengeti. 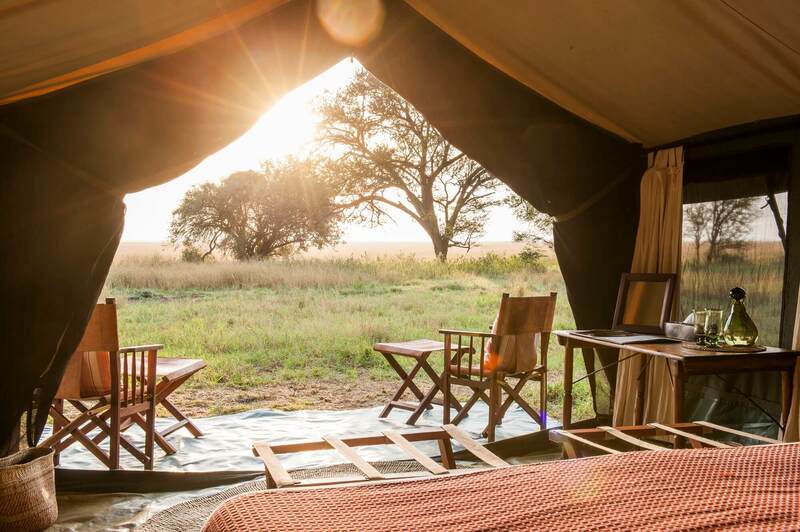 Serengeti Safari Camp is our favourite mobile camp in the Serengeti and is exceptionally well placed to see the Great Migration year round as it has two camps which move 3 times throughout the year (where most only move two times). Then for the beach time, get seriously off the beaten track in Pemba Island for some world class diving and snorkelling, before heading back to Zanzibar for some luxurious relaxation and white sandy beaches. Day 15: Flown to Dar es Salaam for onward flight. So this is a pretty luxurious trip! 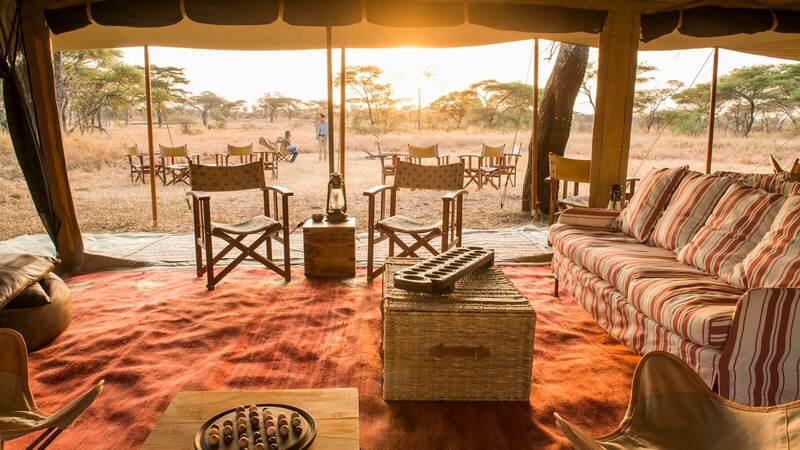 Here, the focus is on luxury camps and lodges, but more importantly in some of the best game viewing areas of Tanzania which everyone else forgets about! Namiri Plains is set apart form any other lodges in the Serengeti and as it is set on an old cheetah conservation site, the big cats are absolutely out of this world here. They are everywhere! Then flit down to Ruaha for serious luxury in a very wild environment. With only a handful of lodges and camps in this (huge) park, and exceptional wildlife, Ruaha is probably the office’s favourite in the whole of Tanzania (and even Africa). Mnemba Island is the crème de la crème of Indian Ocean beach retreats… And is completely private. It is the ultimate destination for those who really want to get away from it all. Day 14: Flown to Dar es Salaam for onward flight. We hope these itineraries inspire you to explore Tanzania as it really does have so much to offer. We get asked a lot about how much money and what kind of money to bring on a Tanzania holiday. We hope this blog clears up the confusion! So throughout Tanzania in the lodges, hotels and camps you will be staying at, US dollars are widely accepted. No need to even go to the bank if you are coming from the US! On safari, most of the camps and lodges we work with operate on an all-inclusive basis which means all your game viewing activities are taken care of, as well as food and drinks during your stay. The only thing which is not included is any personal purchases, or premium spirits. It could be that your accommodation is full board, which still means your game viewing activities are included (as in all our itineraries) as well as all your meals, but drinks are excluded. If you are heading off to Zanzibar pre or post safari, most of the mid-range options and bigger hotels operate on a half board basis. We usually opt for this as it means your breakfast and dinner are included, but lunch is not, which is just as well because we know people like to get out and about during the day. Your activities will not be included, to make sure you bring some extra cash for these (as well as drinks). Some of the higher end little hotels operate on a all-inclusive basis as they are fairly confident that their guests will not want to tear themselves away from the luxury of their private villas for too long! Drink prices range from lodge to lodge and hotel to hotel, but as a guide, a beer is usually around $3, a glass of wine around $4 and a G&T is probably going to be around $4 too. When on safari, it is completely up to you how much you decide to tip, but as a rough guide, we would usually say around $10 per person per day for your guide, and $10 per person per day to go into the staff tip box, which is usually located in the main area of your camp. You may want to also give your transfer drivers in Zanzibar a little tip too (though we would have included the transfer in the cost, some people like to tip too). Of course though, how much you tip is down to your own discretion and is essentially up to you! 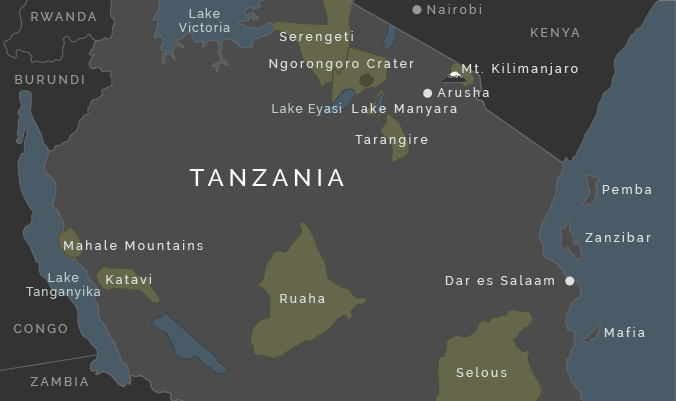 We hope this has been helpful as a guide to how much money to bring on your Tanzania adventure. If you still aren’t sure, give us a call and we can take you through any extra costs on your specific trip. So when most people think of a beach spot in Tanzania, the main Zanzibar Island springs straight to mind. 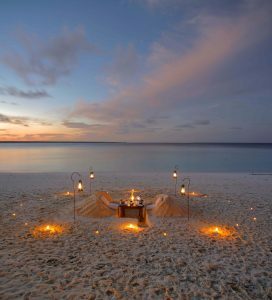 However, for the intrepid beach lover, there are other islands in the archipelago which may suit you even more, or as a combination with the Indian Ocean paradise that is Zanzibar. 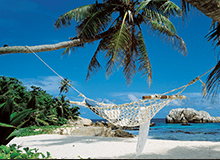 Privacy: If you want a completely secluded private island experience, Zanzibar is not for you! Some beaches bustle with local life whilst others are relatively private (not officially private, but as private as non-official private can get!). 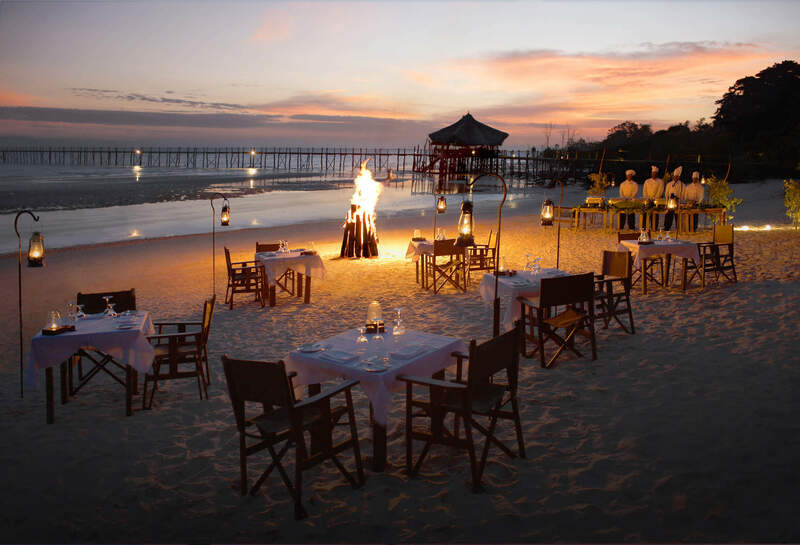 Accommodation and cost: This is where Zanzibar comes into it’s own – there is such a huge array of accommodation from stylish boutique hotels, to 5 star big builds and even to an almost private villa experience at seriously reasonable prices. 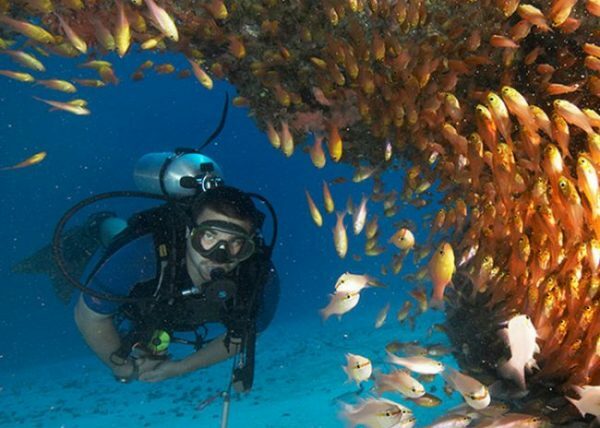 Snorkelling and diving: The snorkelling and diving of Zanzibar is very good. Many head to the Mnemba Atoll for some spectacular diving. Best for: Pretty much everyone! 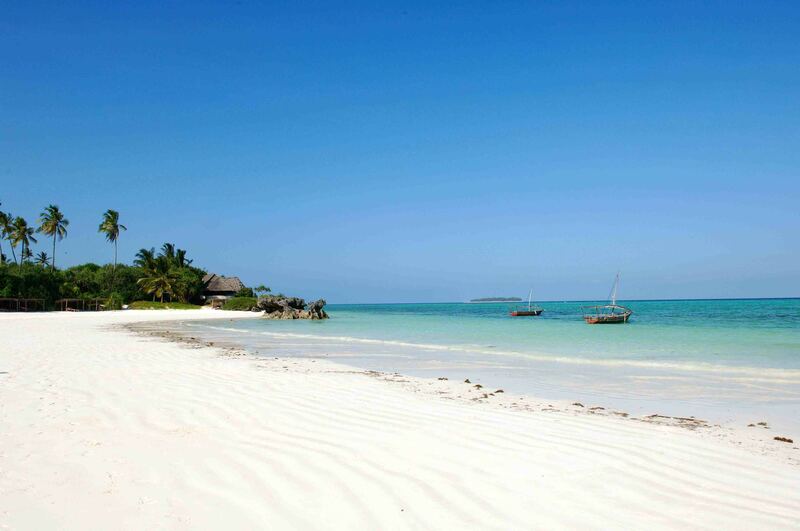 Zuri Zanzibar’s beach… It is phenomenal. Beaches: The beaches on Pemba are not as good as Zanzibar, and are all very tidal. However, there is the little Misali Island just off the west coast and near our favourite honeymoon spot, Fundu Lagoon, which offers white sands forever for that slice of Indian Ocean paradise which is missing from the mainland island. Privacy: Pemba is very off the beaten track though and offers an authentic slice of Tanzanian island life. It is not only a beach destination but a fascinating place to visit in itself. On your activities you really do get a sense you have the Indian Ocean all to yourself, which you just can’t get in Zanzibar. Accommodation and cost: There are only 3 main lodges we like to recommend on Pemba. They are not for budget travellers but suit mid to high end travellers. Snorkelling and diving: The diving from Pemba island is among the best in the world. For divers, there is nowhere better than here and Mafia Island. Best for: Divers and honeymooners looking to get off the beaten track. 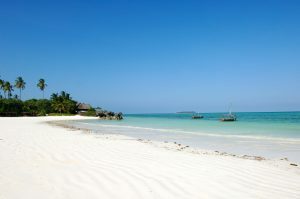 Beaches: Similarly to Pemba, the beaches on Mafia tend to be quite mangrovey and tidal, so as such we would recommend looking at Zanziabr for your Indian Ocean white sands forever experience. Privacy: Mafia is only home to 2 lodges which we like to recommend, and as such if you are looking for uninterrupted Indian Ocean adventures, it is fantastic. Accommodation and cost: The accommodation on Mafia is reasonably priced and you get a certain amount of luxury, however, it is pretty rustic when compared to options on both Pemba and Zanzibar. Snorkelling and diving: Where Mafia shines above the rest is in it’s excellent whale shark populations. 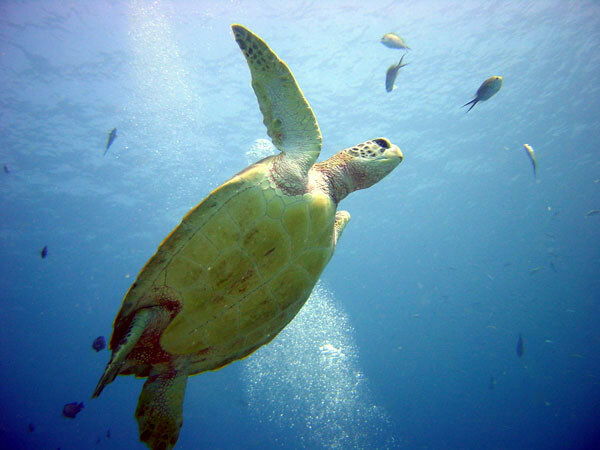 You can enjoy a snorkelling excursion to go see these huge and fascinating creatures. The diving is also tremendous. Most visit Mafia simply to get a glimpse of the whale sharks. Best for: Very keen divers and for those who want to see Whale Sharks. Beaches: Pristine, white, sweeping – everything you could wish for from an Indian Ocean hideaway. Privacy: Mnemba is completely exclusive as it is owned by &Beyond and is the only lodge on the island. You have the whole place to yourselves with the other guests staying at the lodge. In our eyes, it is probably one of the best and more sought after honeymoon destinations in the world. Accommodation and cost: But… This comes at a price! The bandas at nMnemba are luxurious yet still rustic and wooden without a glossy 5* type finish. We absolutely love them. Staying in such exclusivity though does come at a cost as staying here can cost you up to a staggering $1,500 per person per night. 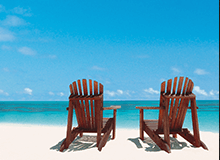 Best for: Honeymooners, a holiday of a life time and those seeking absolute Indian Ocean perfection. Beaches: Fanjove Island, alike with Mnemba, has absolutely beautiful beaches. It is set apart from the other islands and is situated in the southern waters off the mainland coast near Songo Songo. Privacy: Alike with Mnemba again, Fanjove is owned by a safari company who have the whole island and so this is a completely exclusive experience. Accommodation and cost: Unlike Mnemba, Fanjove is extremely reasonably priced. However, if you are looking for luxury, this is not for you. It’s bandas are very basic and are the epitome of what we like to call “beach shack chic”. 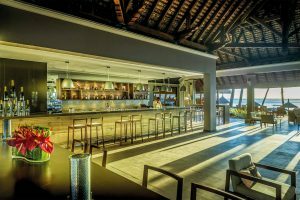 The perk here is that if you are not bothered about luxury, you can have one of the more pristine Indian Ocean locations all to yourself for an extremely reasonable cost. Snorkelling and diving: Snorkelling and diving off Fanjove is also excellent. 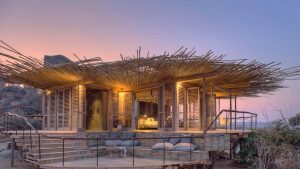 Best for: Honeymooners, families or those just seeking seclusion and authenticity on their African adventure. Beaches: So the lodge we think reigns absolute supreme on the mainland coast is Ras Kutani. This is in our view probably the best beach lodge in East Africa. With a spectacular beach which is also absolutely secluded, you can’t get much better. 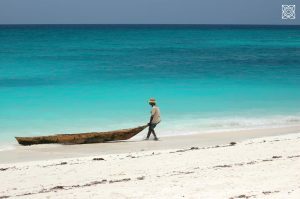 Privacy: Unlike some of the busier beaches in Zanzibar, Ras Kutani is on the mainland coast and as such is well away from tourism and any kind of bustle whatsoever. It is a hidden gem, and we hope it stays this way for a long time to come. Accommodation and cost: What’s more, Ras Kutani is exceptional value for money. The style of the lodge is the ultimate “barefoot luxury” experience, meaning it is extremely comfortable with very attentive staff, excellent food, comfortable beds, a glorious setting but without glitzy frills. Snorkelling and diving: Ras Kutani does not have good snorkelling and diving and is a place for relaxation. Best for: Any kind of traveller/group/couple or honeymooner who is looking for a place away from it all to relax in absolute Indian ocean paradise. Along with being dazzled by the azure ocean, pristine beach forest and silky white sand, there is so much underwater fun to be had in the warm waters of Zanzibar. Zanzibar is one of those magical destinations that perfectly combines equal doses of exhilarating sea adventures with peaceful, feet-up relaxation. If you’re in the mood to get more than your feet wet, you can dive down to encounter the diverse, colourful marine-life that glides over the coral reefs they call home. 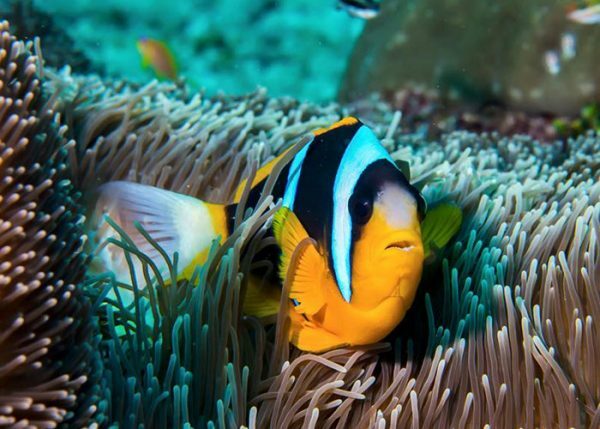 Zanzibar pretty much has all the great diving and snorkelling spots so if your dream holiday includes ocean exploration and adventure, read on to find out more of what you can expect on this special island off the coast of Tanzania. Zanzibar is, quite simply, a diver’s paradise. With an average water temperature of 27 degrees Celsius and visibility between 20 and 60 metres, it is a great diving destination throughout the year. Leven Bank is only for advanced divers as drops can descend as deep as 55 meters and strong currents call for serious endurance. Once you reach the underwater landscape of rocky, coral-laden outcrops that teem with a variety of fish species, you’ll realise the hard work was completely worth it. Possible sightings at Leven Bank include whitetip reef sharks, dolphins, rays, honeycomb moray eels, barracudas, tunas, bluefin trevallies, guitarfish, triggerfish, and groupers. Nankivell and Hunga Reef are both great for beginner divers as their deepest drops range between 12 and 16 meters. 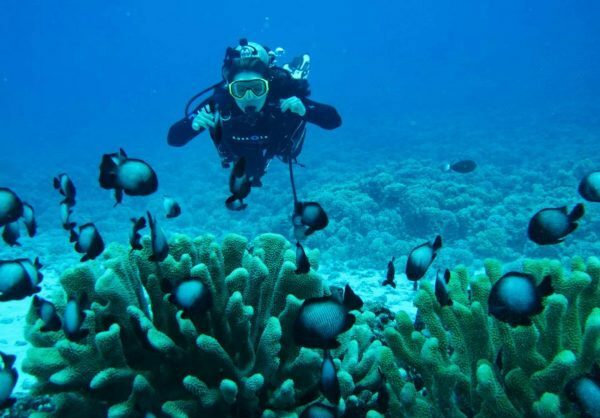 Although not very deep, these dive sites still make for spectacular visits into the world of interesting coral formations that are the playgrounds of diverse marine-life. There are opportunities to see reef sharks, dolphins, barracudas, snappers, silver sweetlips, Napoleon wrasse, groupers, parrotfish, surgeonfish, and lobsters. Also check out: Boribu Reef, Kendwa Reef, Renco Bommi, Shane’s Reef, Chakatuni, Coral Garden, Mbwangawa, Turtle Gap, Haji, Kichafi, Misoli, and Leon’s Wall. As with diving, Zanzibar and its surrounds have an impressive list of snorkelling spots. Conditions and visibility in these areas are top-notch almost year-round, making Zanzibar a haven for snorkelers. Mnemba Atoll is a well-known conservation area in Zanzibar and at the top of most people’s ‘must-snorkel’ list. Average visibility is good year-round and ranges between 10 and 30 meters. Snorkelling along the coast of Mnemba Island will get you up close to beautiful coral reefs, assorted fish species and other marine-life like dolphins, green turtles, and sea stars. Tumbatu Island offers a prime snorkelling spot away from the maddening crowds and closer to local people that live more traditionally than those found in the touristy areas. Since Tumbatu is less frequented by human visitors, the marine-life here is curious. Expect to swim near to bat fish, rare cute whip, ribbon eels, and leaf fish. Also check out: Kendwa Reef, Chumbe Island, Stone Town Reef, and Prison Island. Chat to us about planning an exciting island getaway to Zanzibar. For every type of traveller, we would recommend Zanzibar over Mauritius as a beach destination for a few reasons which we will expand on below. Ok, so Mauritius is classically the family destination for families. However, we think you can have just as much of a family adventure without spending a premium on lengthy flights in Zanzibar. Here’s why! 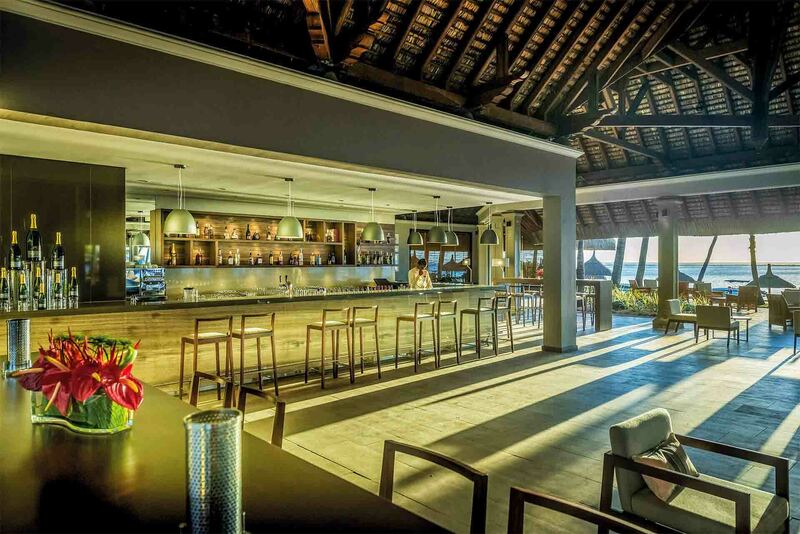 Mauritius hotels are classically rather big, and can be soulless if you don’t choose carefully. Mauritius accommodation options, although with glamour and all the amenities you could wish for, are generally pretty soulless. Mauritius is a place of big hotels and we really prefer the little boutique options which Zanzibar does so very well. If big hotels are what you are after though, then Zanzibar has this too! 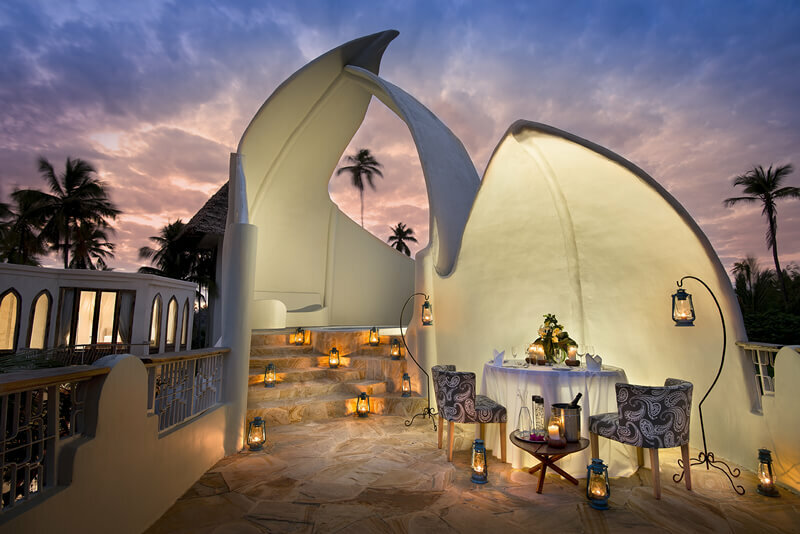 Although there is a lot of bad accommodation on Zanzibar which can trick tourists, we often visit and re-visit, so have a handful of our favourite beach hotels in a huge array of different styles. Ok, so Zanzibar is not quiet in regards to tourists, but Mauritius is BUSY. There are some good stretches of beach in Mauritius, but if they are good, they will be seriously busy! Mauritius even has some artificial beaches, which really demonstrates how it is not home to the Indian Ocean stretches of paradise which many imagine it as. 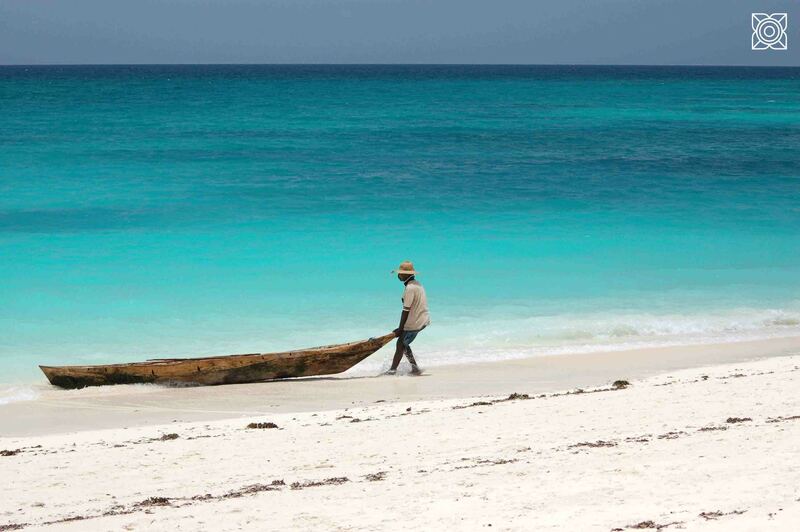 Zanzibar, although tidal, has some pockets of seriously beautiful beaches which are not saturated with tourists. A beautiful undisturbed Zanzibar beach. Off Zanzibar there are some incredible diving spots – some of the best diving in the world happens of Zanzibar’s neighbour, Pemba Island. The snorkelling is also incredible with it’s beautiful coral reefs which surround it. Mauritius isn’t really a diving destination, so if this is your primary interest then definitely head to Zanzibar for some relaxation and either stay there for great diving, or head to the surrounding islands for some world class underwater scenes. Mauritius is an array of 5* hotels, and when you look at flights too, this can add up to a very costly holiday. Although there are cheaper options in Mauritius, these options are nothing in comparison to what you can get for your money in Zanzibar; our favourite little boutique hotel haven. The flights are so cheap and easy, we even get some clients tempted by a beach-safari-beach combination. 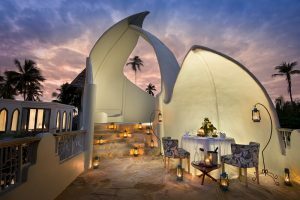 Comments Off on Mauritius vs Zanzibar – Which should I choose?